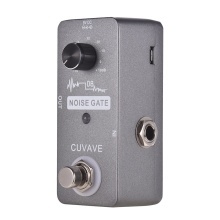 Noise gate pedeal for guitar and bass noise reduction, enables you to get clean and pure guitar/bass tone. With one knob for adjusting noise control level(-70dB to +10dB). True bypass footswitch for switching between noise gate function and bypass status.